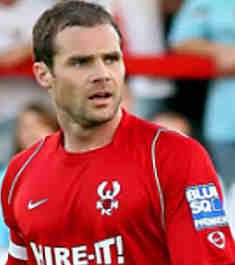 Stuart Whitehead joined the Harriers at the end of May 2006 after signing for us from Shrewsbury Town. He was born locally in Bromsgrove but has played his football as far North as Carlisle. He came to Aggborough with a fine reputation as a tough tackling defender with a no nonsense attitude on the field and was soon made Captain. Towards the end of his time here he suffered a loss of form and his contract was made void to allow him to join AFC Telford.